Playing through Skyhill, it’s hard not to indulge in a constant game of “what if.” What if there was more than one playable character? What if there was more variety in level design? What if the gameplay mechanics changed or evolved? Skyhill has some strong ideas but about halfway through, there was nothing but "what ifs" left. 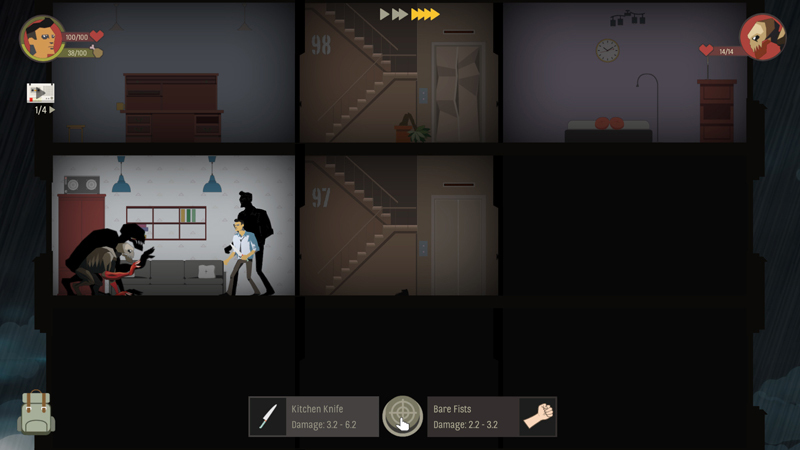 Skyhill is a roguelike, that recent darling genre of indie houses and small developers, but it’s much more deliberately paced and less frantic than many of its brethren. In fact it can be downright relaxing, which is not an adjective one associates with roguelikes, at all. The less kind way of saying this would be to say that the game can be pretty repetitive. The set-up of Skyhill’s story is that go-to, always open, how-can-it-go wrong premise of a post biological attack/apocalyptic world filled with mutants and zombies. Perry Jason wakes into a nightmare scenario in the top floor penthouse suite and the game consists of Perry trying to reach the street, 100 floors down. In the progress of his long descent, Perry searches for healing supplies, food, weapons, and spare parts with which to craft better food and weapons. Every so often -- much more often the closer he gets to his goal -- he will encounter and fight a zombie or mutant or another of a handful of enemies in turn-based combat. Perry has two critical stats that the player needs to watch and manage: hunger and health. Exploration creates greater hunger, but it’s a necessary evil, because materials must be found. Combat impacts health. Perry can rest in his penthouse but resting to increase health also increases hunger. From start to finish, there is no steady state and one or both of Perry’s stats will always be changing, usually not for the better. While in his penthouse, Perry can craft healing items and better weapons or more nutritious food. There is a constant temptation, though, to consume items rather than keep them for later crafting, and sometimes they must be consumed in the process of trying to repair an elevator or power a light. Perry earns points in combat that can be used to level up one of four basic stats. The level design of Skyhill remains the same from top to bottom: a central stairwell with a single room on each side. Items and enemies are randomly generated so every replay will be slightly different, and there is a definite element of luck in creating a strong early foundation. Still, the unvarying repetition of each floor and the pattern of exploration and combat becomes fatiguing in fairly short order. Combat in roguelikes usually creates a sense of urgency, but in Skyhill the monotonous back-and-forth turn-based rhythm never really changes. Perry can hit his enemy in a general way or target one of three zones (head, arms, or body), and each approach -- depending on Perry’s level and weapon -- has risks and benefits. The generally bloodless and dull combat gives every encounter the visceral excitement of watching an animated spreadsheet. You watch the stats tick down and either start over or keep going. Skyhill’s 2D art style is a little like a very starkly drawn graphic novel, and in fact there are occasional cartoon panels that illustrate key plot moments. Perry has one walking animation and one combat animation and many of the rooms are virtually empty. It’s not that it’s an ugly game, just so empty and flat that it lacks character. It looks and feels very much like a game pulled from -- or headed to --the mobile space, where details can get in the way. Skyhill has some good ideas, and as a genre, roguelikes are due for an infusion of creativity. The slow descent through increasing deadly or disturbing enemies, the way the game handles the balance of hunger and health, the RPG element -- these all work pretty well. But: what if there was a little more choice in that main character, or what if Perry found some friends along the way, or what if, somewhere around the 50th floor, the design started changing and the difficulty came from clever new enemies and not just more of the same? What if success was based on player skill rather than luck? Ultimately, whether you play Skyhill once or a hundred times, there is little chance of becoming a better player, and there’s zero chance of seeing something new along the way. What's impressive about Dead in Vinland - part survival management, part RPG, part roguelike and part turn-based combat game - is that instead of being a Frankenstein's monster mashup, it pretty painlessly melds so many disparate genres. Even more complex than the developer CCCP's previous entry into an eventual trilogy, Dead in Bermuda, Vinland has interesting and amusing characters and a lot to keep the player occupied. If you skipped the original, now is a great time to drop in and see what you missed, and The Following adds dozens of hours of new missions and things to do outside the city.